The Women making work work series celebrates flexible working and women finding ways to, maybe not have it all, but have what they want. This first week is going to be about me. Regular readers will know that I have four children and there is less than four years between the eldest and the youngest. This means that if I were working full time in a traditional 9-5 office role I would have been paying for four private nursery fees. We live in London and that would have been madness as nurseries cost around £80 per day. My reality made me think more about making work work for me. This is my story and route to flexible working. My background is in HR and I spent many years completing post graduate qualifications and becoming chartered with the CIPD. My career was largely in the City of London in financial institutions and then for a large international property developer. I travelled extensively and worked long hours, but I loved it. My role was rewarding and always varied so I was constantly challenged. After having my first child everything changed for me. I never planned or wanted to be a SAHM, but once he was here I never wanted to leave him again. We felt that financially we couldn’t make it work if I didn’t go back to work though and so I started talking to my employer about part time or flexible options. Ultimately they suggested a job share so that I could do 3 days a week and I was thrilled. However, as with so many women that I speak to this was really just a ticking box exercise for the company. They were busy high fiving each other about how progressive they were being, but the reality is that they set up the job share to fail. There was no physical overlap between me and my job share partner and so her job became just finishing off the bits I hadn’t completed. We couldn’t work together as such as I, having worked in the business for years, had all the contacts so it made sense for me to engage with the clients. It was impossible for her to build relationships with only two days in the office and so she was a bit bored! Also we were basically given all the crap that no one else wanted to do. My previous HR Business Partner role was basically reduced to the team administrator and I was unimpressed. Like so many others, though, I was just hugely grateful that I was allowed to work 3 days a week so I just kept my mouth shut. Well I did until they changed the grading system at work and suggested that I was to be a lower grade than the other business partners. I was NOT having that!! 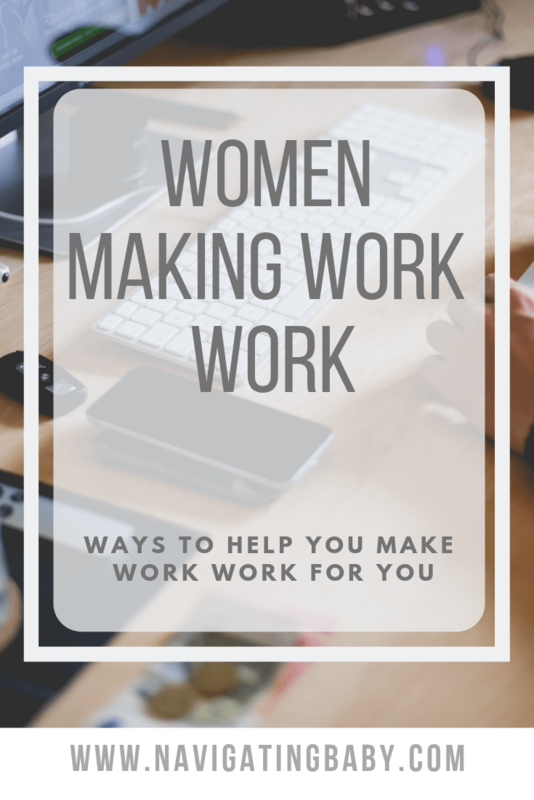 They wanted to downgrade me because I was working part time and because I didn’t have a client group, but I wanted a client group they had taken them away after my maternity leave. This is not what we had agreed. I was livid and totally threw my toys as it seemed that all of my hard work to get to my level in the company was undone by the fact I had become a mother. After much stress and battling I was given back my client group and my grade was the same as the other HR business partners, but by then I had lost the trust so when I was pregnant with my second child and the business was being restructured I asked to be made redundant. It was a chance to move on and find an alternative. I wanted something that was actually flexible and not just me trying to do a full time job in 3 days. It is a move that I have never regretted. My initial solution was to retrain. I looked for a role which I felt was more family friendly and became a baby and toddler swimming teacher. This seemed like the perfect solution as it was term time only and I only worked around 12 hours a week giving me loads of time to spend with the kids. I did love it and teaching the kids was a delight, but then I got pregnant with the twins and after they came it was too much. My younger son was only two and he struggled so much with me having two other babies to have me going in and out all the time to short teaching shifts made him so sad. It also made me sad. I felt like I was going to become a bad employee as I knew I couldn’t give it everything it needed and I felt like I was being a bad mummy as I wasn’t giving my little boy what he needed and so I had to give it up. I had really enjoyed being a swimming teacher, but on the day I taught my last class I felt nothing but relief and it was the very best decision for me and my family. I had started making work work for me by making the decision to leave. For a while I was a SAHM and that was enough challenge for me, but as the twins got older and my sons were at school I felt like I could take on other things and I did want to make a financial contribution to the household as well so I started my business as a CV Writer and Career Coach. This is perfect for me with little kids as most people who are looking for a new role don’t want to talk during the day. They want to talk after work and that is when my kids are in bed or at least when the husband is home so my work doesn’t impact the kids at all. The best thing about working for myself is that I call the shots. I decide when I work and who for (I sound like Kit from Pretty Woman) and I manage my own time. I am responsible to my clients, but ultimately it is up to me whether I meet the deadlines. I also love that I have found something where I can use my HR expertise to help others. I don’t feel that I am wasting all of my education as I am still using my knowledge, but I am also not trying to be the old me who could stay late, who could travel at a moment’s notice. What isn’t so great about working for yourself? The worst thing about working for yourself is the uncertainty. Who knows when the next client is coming? You simply can’t rely on the income. I am lucky that we don’t need the money that I make in order to survive as then working for myself would be very stressful I think. As it is I am very lucky to be able to pick and choose the projects that I take on. The flexibility also means that I can upscale as my children go to school. I think you also need to be very disciplined about working. On the days when my girls are at nursery I have to apply myself and I can’t get distracted as otherwise I won’t make my client deadlines. It can be very tiring as I often end up having to work in the evenings and most client coaching calls are once people are home from work so I can often still be found working at nearly midnight knowing that there is a large risk that those little people will be up in the night. All in all I love working for myself and have found it to be the only way that I can make work work for me! It is hectic and there are times when I am sitting and working whilst the kids play, but I feel more present than I think I would if I were back in the city and I see this to be a really small compromise. Of course I don’t make anything like as much money as I did when I worked in the City, but the flexibility is so much better for us and I would recommend flexible working to anyone. I would also recommend trying different things to see what works for you. It may not be that you first thought is actually the answer as long you don’t put yourself in a financial quagmire I would always say go for it! It is tricky isn't it? We just need to keep on doing what we enjoy and hope that it all comes right! #DreamTeam Jo (A Rose Tinted World) recently posted...Teeth Whitening – Are You Gambling With Your Smile? Great inspiring story, wow, that's something? downgraded in work after coming back from maternity? sounds very dubious to me... glad to hear that you found somewhat of the right balance, keep on rockin'!! #dreamteam Isabel recently posted...Is winter the creative season?